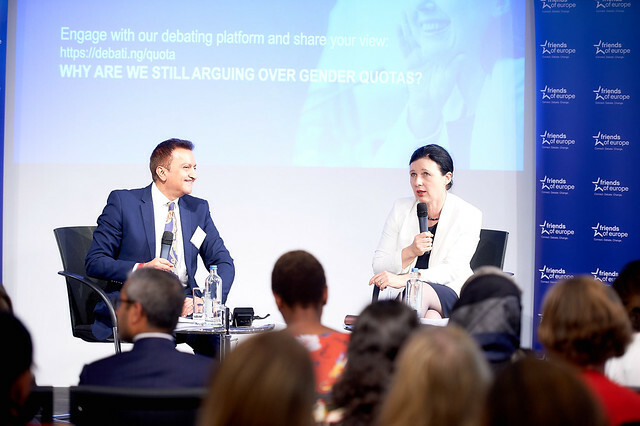 The strong economic arguments for addressing Europe’s gender imbalances will be a powerful tool in countering Europe’s stagnating progress on gender equality, argued Commissioner Vera Jourová at a Friends of Europe debate on 26 June. Instead, it was only by highlighting the huge economic losses society was suffering through gender inequalities that she could focus minds and fight the ‘counter revolution’ which had been appearing in some member states. She didn’t spare her Commissioner colleagues from this analysis either, emphasising that the relatively large number of women in the Junker Commission had made the EU better at responding to the myriad of issues it had faced since 2014. Whether dealing with the crisis in Ukraine, Brexit or migration across the Mediterranean, her personal experience suggested that a gender-mixed structure produced the most measured responses. On the upcoming European elections, the Commissioner stated that only the potential for electoral gains would shift the attitudes of political parties and ensure a more diverse party list. She did however caution that, although she personally wished that more women voted for female candidates, an overt campaign to promote this may be counterproductive in some member states. However, as the debate drew to a close, the Commissioner took the opportunity to make one final call to arms for women: “Let’s get elected because we are better, we are brilliant, we see beyond the horizon and we can change the world for the better”.